The River Charente may not be the longest or most famous of French rivers; nor does it have the same iconic status as the mighty Loire and it's vineyard-filled valley. However, this languidly meandering waterway has its own unique charms. Once decreed by no higher authority than French monarch François I as 'the most beautiful stream in the kingdom', La Charente snakes its way through some of south-west France's most ancient counties. It is also where visitors to this enchanting corner of the country can find the region's newest (and dare we say) loveliest new campsite, Camp Laurent. When expat Tracey first laid eyes on the Poitou-Charente, it was love at first sight. Setting up camp (quite literally) in the summer of 2013, Tracey's vision was of a tranquil retreat– easily achievable due to the adult's only admittance policy. Nestled in eight unspoilt acres just outside the sleepy village of St-Laurent-de-Ceris, Camp Laurent has ample room for just 10 emplacements with six hook-ups. The pitches overlook the river and valley below, while butterflies, rabbits and the odd roe deer dominate the scene. Facilities are more than adequate with wet-room style bathrooms featuring hot-showers, modern toilets, laundry and a washing-up adjacent to the 200-year old stone barn. With the river on your doorstep, you could be forgiven for neglecting the brand new, open-air, wood-panelled pool – just the ticket for cooling off in France's second sunniest region. With 400 metres of river frontage, the site makes an ideal base to fish the Charente's abundant trout, carp, pike, perch and eels. A lazy paddle in a canoe or a cruise in one of the numerous pleasure boats makes for a great way to explore the idyllic nearby towns and villages. You'll take in such famous names as Angoulême, Saint-Savinien, and Cognac – yes, the very same. Just be sure to appoint a designated skipper for the way back to camp. Tracey, Pete and our little French Bulldog Lucy would like to welcome you to Camp Laurent. Camp Laurent is a place that has been lovingly created to offer camping exclusively for grown-ups (but not too grown up!). Lucy would love to invite friendly dogs to join us at Camp Laurent and make some friends along the way. We spent many years looking for campsites to visit that offered a peaceful, tranquil, scenic ambiance and allowed us to escape the hustle and bustle of everyday life. This is why we decided to move to this beautiful region of France and set up camp, with Camp Laurent. We have always used the Cool Camping Guide to find those little hidden gems, so we were obviously inspired to be part of it and why we created this little place we call Camp Laurent as well as our new home. If you are seeking a little oasis of peace and relaxation this is certainly a place you can fall in love with. To wake up every morning to the beautiful panoramic view over the valley. While watching the Birds of prey gliding over the woodland and river that borders our site. For those of you who love wildlife we have an array of beautiful butterflies, damsel flies and even the odd firefly which glow in the evening. Not to mention the uplifting sound of bird call at sunrise and sunset. As the evening draws near and the sun begins to set on our vast horizon you can bask in the glow of the sun as it makes a Technicolor sky comes alive. Is for people to have freedom...while using common sense and courtesy. We have no rules at Camp Laurent... no allocated pitches, no curfew on the pool (a midnight swim in the pool can be quite nice in the hot summer months). Ok, when I say we have no rules, that's not including the one rule... the only rule... to enjoy Camp Laurent (including the many bottles of wine you will enjoy while you are here)!!! At Camp Laurent we have room for 10 very spacious places to camp. Our lovely pool is only ever a few degrees below ambient temperature so very nice to cool off in while enjoying more of that lovely panoramic view, which is at its most breathtaking here. Our toilet facilities are held to the highest standard with a ladies and gents wet room style bathrooms with plenty of space to prepare for the relaxing day ahead. We can arrange bike hire for you during your stay so you may explore the area more intimately. Or why not wile away the hours with some fishing or canoeing on the river that borders our site..
Other stuff... Washing facilities, washing machine, tourist information, book club, useful maps, grey and toilet waste disposal. For latest availability and best prices for Camp Laurent, please use the Date Search above. Ten grass pitches. Swimming pool with seating area. Electric hook-ups available. Wash block with disabled facilities in wet room-style bathrooms, hot showers, toilets, a laundry and washing-up facilities. Free boats and canoes to borrow and fishing on the Charente possible. There are plenty of cycling and walking routes in the surrounding area including route 48 which is on Camp Laurent's doorstep. The River Charente offers a wealth of great activities including canoeing, fishing or simply taking a leisurely barge cruise. The Lacs de Haute Charente and River Vienne promise similar waterside fun – including a beach. If you're visiting in August, the nearby town of Confolens hosts its annual world music festival. The 5-day summer event attracts around 30,000 visitors per year! Confolens itself is beautiful, intersected by the idyllic River Vienne and two historic bridges. The Château de Rochechouart and the castle at La Rochefoucauld are also well worth a visit. If it's educational thrills you seek, the Futuroscope (0033 549 495 906) theme park and La Vallée des Singes monkey park (0033 549 872 020) make a great day out. 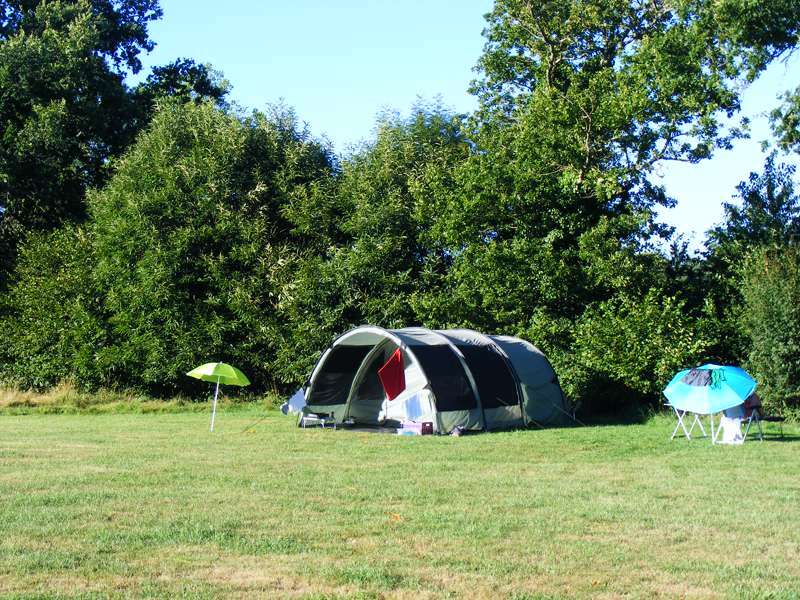 The camp is also ideally located to explore Bordeaux, Dordogne, Limousin and La Rochelle. The nearest bar/restaurant called Le Marronnier is in St Laurent de Ceris about 4km away. There are also lots of little surrounding villages that offer an authentic French culinary experience. Several large supermarkets can be found in Roumazieres-Loubert and in Confolens. About 40 mins drive away in the region capital Angoulême, you'll find an eclectic, trendy mix of places to eat and drink. La Ruelle (033 545 951 519) is an eccentrically decorated restaurant in a converted transport depot. It serves refined French cuisine with a contemporary twist. No visit to the region could be complete without sampling Cognac's famous brandy and the town's lesser-known aperitif, pineau. Try some Limousin boeuf too if you get a chance – bon appétit. €20–€29 per pitch per night based on 2 persons sharing. A supplement of €5 euros for up to 4 per pitch is also offered. For sat nav, type in coordinates N 45.96126 E0.52819; postcode 16450 and then the commune name Le Fournet. This will bring you straight to the doorstep. If Le Fournet does not come up on your Sat nav type in 16450, then the road name D345 (selecting the anywhere option on this road). This will bring to within about 100 yards of Camp Laurent.